Horray! Your new Cambria quartz countertops are installed! Quartz countertops have many nice qualities. They are durable, non-porous, chemical, heat and scratch resistant. 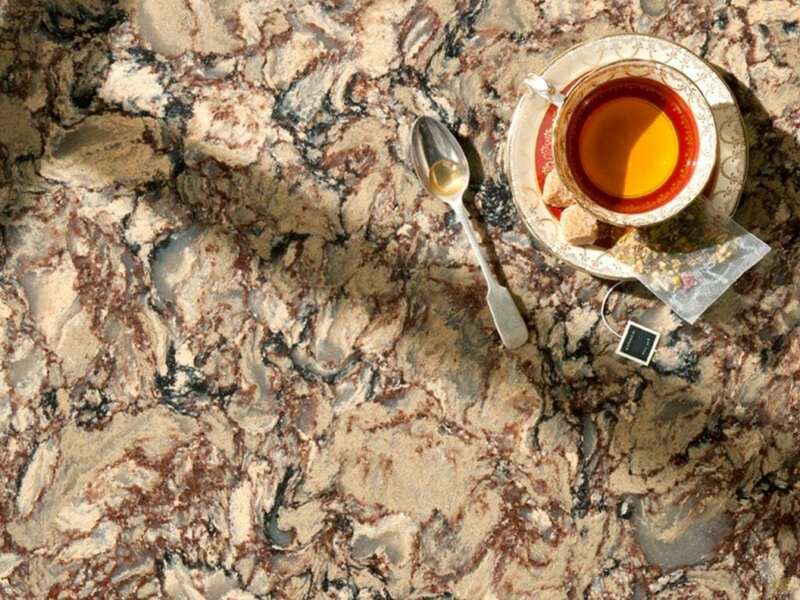 It is one of the most easily maintained countertop materials. Cambria countertop cleanup is quick and hassle free. Here are a few tips and tricks on how to clean, care for and prevent damages to your new countertops. A damp cloth or paper towel should be used for routine daily cleaning of dirt and residue. If necessary a non-bleach, non-abrasive cleaner can be used, such as a 50/50 solution of vinegar and water used for hard water and calcium build up, especially around faucets. Even though quartz surfaces are non-porous and resist permanent staining, wipe up food and liquid spills as soon as possible. For stubborn or dried spills, use a non-abrasive cleaning pad such as a white 3M Scotch-Brite pad with Formula 409 Glass& Surface Cleaner or similar product. Avoid using cleaners that contain bleach. Quartz Surfaces do not require polishing or sealants to maintain their gloss finish. Soapy water is the best treatment for cleaning your countertop finish. 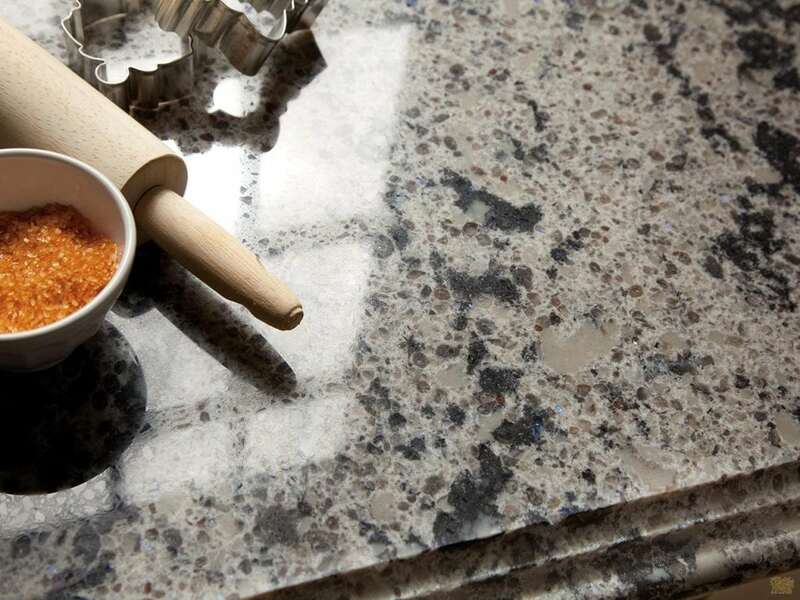 Quartz Surface material can withstand exposure from normal cooking temperatures, but it is susceptible to damage caused by rapid temperature change. It is important to minimize direct heat exposure to protect your countertop surface. We recommend using heat trivets when placing hot objects like pots, pans, electric fry pans, griddles, crock pots and toaster ovens on any surface. Although Quartz Surfaces are resistant to scratches we Do Not recommend cutting directly on your countertop. We suggest using a cutting board. Avoid exposing your countertop to strong chemicals and solvents such as paint removers, oven cleaners, etc. Keep nail polish remover, bleach, permanent markers and inks away from countertop. Avoid prolonged exposure to highly alkaline (high-pH) cleaners. If contact occurs with any substance listed above, quickly flush the surface with water. Sometimes spills occur and dry on the countertop. For materials that harden as they dry (such as gum, food, grease, nail polish or paint), remove by gently scraping away the excess with a plastic putty knife. If stain persists after following instructions outlined in Daily Cleaning & Care, moisten a cloth with Saniten 313 (www.saniten.com), Greased Lightning (www.greased-lightning.com), or a comparable product and rub it into the stain. Let the cleaning agent sit for 15 minutes and wipe the surface clean with a cotton cloth. Rinse thoroughly to remove any cleaner residue. We hope you use this post as a resource to refer back to frequently. If you have any other questions regarding cambria countertop cleanup and how to care for your new countertops, please contact K&D Countertops at 618-224-9635.